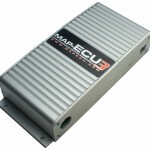 MAPECU3 is our 3rd generation piggy back ECU that not only allows you to tune fuel, ignition timing, etc., but it also adds performance and safety features to the OEM ECU that “chipping” or “reflashing” cannot add. For example, Flex Fuel, speed controlled launch control, nitrous activation, electronic boost control, lean boost retard, etc. MAPECU piggyback ECU’s provide the best balance of everyday drivability, additional features and tuning exactly matched to your vehicle.